Officer Kaleb Barker with Livingston Police Department caught up with the driver of this vehicle in the 2000 block of 190 West. 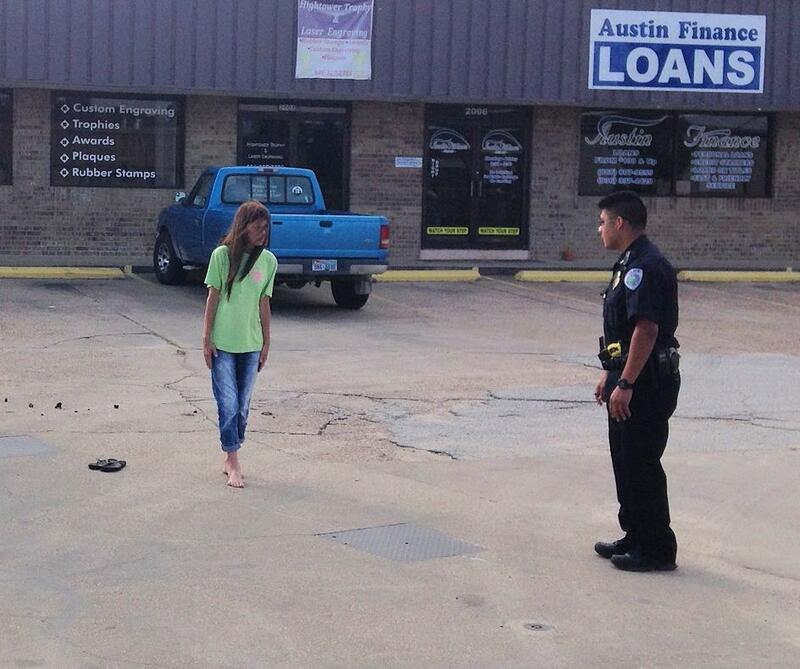 Intoxicated on Pills, Driver Arrested, LIVINGSTON, August 1, 2014 - Shortly before 6 pm on August 1, 2014, a call came in to the Livingston Police Department regarding a woman, possibly intoxicated, leaving the Livingston AT&T store. The suspect got into a blue Ford Ranger and drove away, west-bound on US-190 West. Officers Kaleb Barker and Tito Reyes were dispatched to the area. Officer Barker located the vehicle in the 2000 block of 190. Reyes was quickly joined by Officer Barker. The driver of the vehicle, Hazel Marie Jordan, 47, of Livingston, appeared intoxicated. Officer Reyes conducted a field sobriety test on Reyes and placed her under arrest for driving while intoxicated. Additionally, the officers found Jordan to be in possession of prescription medication. Jordan was driven to Polk County Jail. A rollback wrecker from Ken's Towing recovered Jordan's vehicle and it will be stored at Harrison Body Shop in Livingston. Officer Tito Ryes, with Livingston PD speaks with 47 year old Hazel Jordan of Livingston. Officer Reyes administered a field sobriety test on Jordan. Jordan couldn't walk a straight line. Reyes placed cuffs on Jordan as Officer Barker looked on. Jordan was in possession of prescription medication. Jordan's vehicle was recovered by Ken's Towing.